You had to expect this post from me sooner or later. Actually, probably more sooner more than later...come on, really, how could I resist? I'm in love (and/or obsessed) with the stuff. I could go on talking about it forever (so beware, this might be longer than you'd care to read). But I must spread the word & share the love for the froyo. Plus, I know you are all very curious about Oregon's options. Side Note: In case you were uninformed on the lingo, "froyo" means frozen yogurt. To start, let's delve into some of the nearby, local Eugene options. 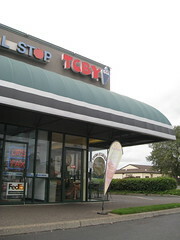 TCBY: This is probably the best option in Eugene for the frozen yogurt craving fix. The reason this one beats the Sub Shop (below) is for two main reason: (1) it has a variety of flavors that change every few days, (2) and the daily specials. Josh really enjoys the daily specials and he almost asks for froyo because of them, which I can't object to. They are pretty good deals though. For example, something like $1.50 for a shiver on Thursdays, which is like a blizzard type thing. The pricing in general is actually quite good. One downside is that they lean heavier on the fruit flavors, and I prefer the candy/chocolate based flavors. Also, the yogurt doesn't keep very well in the freezer for a long time. Overall, I wouldn't go so far as to say it's The Country's Best Yogurt and definitely no Yumi Yogurt, but it does help satisfy my yogurt addiction. 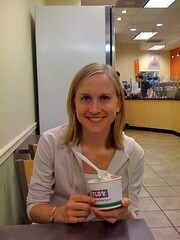 BTW, another point earned this week from TCBY by serving Pumpkin! Campus Sub Shop: I don't think I would have ever known about this place (well, my froyo radar probably would have kicked in at some point) if it weren't for my friend Jessica Geller. This may lead you to ask: how did she know there was froyo at a tiny sub shop in Eugene? Well, Jessica went to U of O and we meet while I studied abroad in Madrid. And we talked much about our froyo cravings. Anyway, this is really like the name of the establishment indicated, a sandwich joint. They do have 4 standard machines (yields 8 flavors) and have the YoCream brand. However, they never change flavors. Luckily, they have peanut butter, chocolate, and vanilla. I get this mix as a quarter once a week to keep as "safety stock" in our freezer. Someone did mention they get pumpkin in the late fall though...only time will tell. For that, I'll ignore the funny smell in the store (yes, a funky store smell). All American Frozen Yogurt: This is at the bottom of the list. I've been only a few times, as it's not the best. The flavor and texture just doesn't compare. Plus it's inside the mall, so it's funky hours and not the most accessible. It is close to the movie theaters though, so it might work out for a pre-show treat. I ought to give it a few more chances especially since the Starbucks I will work at is in a center just across from the mall. Still, I'd probably try to head out to TCBY or Sub Shop even it is more out of the way...worth it. And there are more options in Oregon, but not as close as the above. YoCream: YoCream is probably the most widely distributed frozen yogurt mix to all the froyo stores. Most stores don't actually make their own yogurt, but rather get it from distributors like YoCream, Wow Cow, or Carbolite. Anyway, YoCream recently opened their own store in Portland airport PDX at Cascade Station (next door to IKEA). They opened very trendy self-serve shop. It's like a mini-yogurt heaven with 5 machines, tons of toppings, and other yummy goodies. I am also able to purchase the mix, bring it home, and put it into my Cuisinart machine. It's not the same, but it works. This probably ties for best option in all of Oregon (alongside A.C. below) that I know of at the moment. Still, I think Yumi is the best. Yumi just knows how to mix the flavors and get the best texture. However, don't pass this up if you're near PDX. It's a hip, and lively place with great froyo! Active Culture: Here's the kicker on this one...the owner of this shop was a former Yumi Yogurt employee down at the Santa Clara location! He was inspired and opened his own shop, trying to follow many of Yumi's methods. I really liked this place as the temperatures seem to be set right to get a great consistency. The only probably is that the flavors change only weekly, and sometimes I've gone and they had only fruity type flavors (boo--give me cookies n cream, give me graham cracker cheesecake!). And it seemed on the pricy side. All things considered, I rank this right up there with YoCream as an Oregon top option. Yogurt Hut: This shop is located in Ashland (Southern Oregon) and is yet another ever-so-popular self-serve option. It serves the YoCream brand, so it's pretty good. I don't think they have the temperature quite right, so it loses a few points there. Again, a bit pricey (or maybe I just don't know when to stop!). I don't get down to Ashland too often, but it's there if I travel back to CA by car or go to a play. If you are in Oregon or know of any other Oregon options, please let me know with a comment or email!